Before you make a purchase, let Kinnek do the hard part. Submit a free request for quotes using the form to the right, and we'll get multiple suppliers to provide you their commercial grill offerings and pricing so that you can compare all your options in one place! Grilling involves the application of direct, dry, radiating heat to the surface of food. It is a rather inclusive term that encompasses a wide variety of techniques and equipment, but ultimately, most grilling seeks to infuse the grilled foods with a unique roasted flavor (and sometimes with a smoky flavor). Grilling is also though to be healthier than pan-cooking with oil. The purchase of a commercial grill - whether you choose a standard outdoor gas grill, a charbroiler, a griddle, or a flattop grill - will help you to achieve a uniquely roasted flavor that may not otherwise be possible with your existing kitchen equipment. With the purchase a gas grill, you will also have access to a smoker’s box to use wood chips which add additional smoky flavor. As there is a great variety of grilling equipment offered by suppliers, consider your specific needs before purchasing a grill that is expensive to run and that may be larger than you need. An outdoor grill is a great option for restaurants with more significant grilling production needs (outdoor grills tend to be larger and less expensive than integrated indoor setups), but they serve other purposes: an outdoor grill may suit the atmosphere that your restaurant brand is trying to project, and further, if your restaurant is located in a heavily trafficked pedestrian area, then the smell coming off of an outdoor grill may serve as an advertisement. When purchasing an outdoor grill, the most important considerations are fuel type, size, and material. As to fuel, you will generally be choosing between the natural gas option or the propane tank option. Natural gas is preferable as it is much less expensive and much more convenient to use natural gas than to constantly keep track of and replace propane tanks, but natural gas may not be an option if you do not have a gas line easily available for a hook-up. 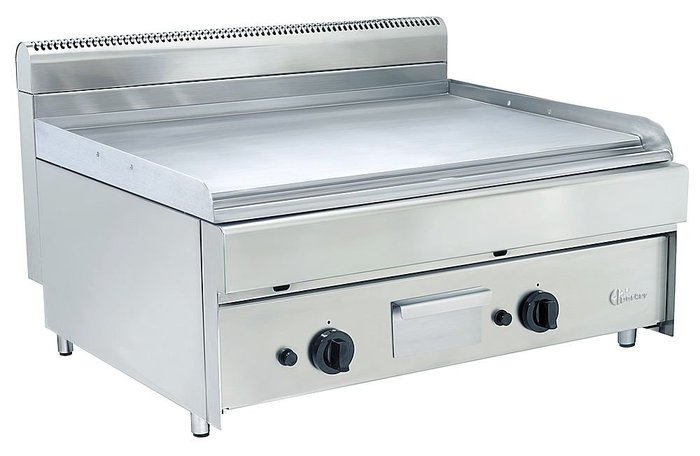 With regard to size, most suppliers recommend that production needs be slightly overestimated, as your production needs may go up (spikes in crowds can be difficult to anticipate), and it is a more complicated process to replace or expand your grilling equipment than to simply purchase a higher capacity grill. The material with which your grill is constructed will determine the durability of the grill. As a general rule, stainless steel, cast stainless steel, and cast brass are the most durable materials commonly available from suppliers. When shopping for steel, do prioritize the lowest gauge steel, as it is thicker and stronger. For location-independent kitchens (food trucks, catering companies, etc. ), be sure to let suppliers know about your mobility needs. Many suppliers offer propane grills that can be installed easily onto the backs of trailers, or that are otherwise highly mobile. Charcoal grills and wood grills - though popular with many barbecue purists - are not common in commercial establishments, given the greater difficulty associated with their use, the inconsistency in cooking with charcoal and wood, the expense, and potential cooking inefficiencies. However, if you operate a smaller kitchen and would be unsatisfied with the “smoker’s box” available in gas grills to add wood chip smoky flavor to your grilled foods, then a brazier, pellet grill, or other charcoal/wood grill may be a suitable investment. Integrated or built-in indoor grill units are similar in function and form to outdoor grills — featuring an attachable hood, and fueled by either natural gas or propane tank gas — though they are frequently integrated into existing cooking ranges. Space considerations also present more of an issue, given the limited space in many commercial kitchens. It may be easier to use natural gas for an indoor grill than an outdoor grill, however, as it is more likely that there is an available and accessible gas line inside the kitchen as opposed to outside. 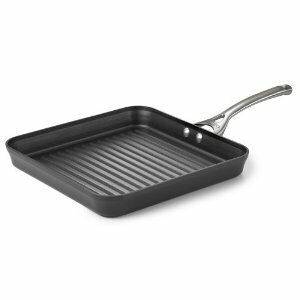 Stovetop grilling pans (with raised ridges to emulate the function of a gridiron) are often used by commercial kitchens to add the expected “sear marks” to meats and vegetables that are not cooked through on a gridiron. Stovetop grilling pans work by applying both direct heat off of the ridges, and indirect radiating heat from the flat pan below the ridges. They are beneficial in that they are rather low-investment in terms of cost, space, and infrastructure (no need for additional gas lines or for propane tank replacement), but some believe that stovetop grilling pans do not infuse food with the same “roasted and smoky” flavor as a more standard grilling setup. If your kitchen does not consistently feature grilled foods on the menu, a stovetop grilling pan may be a choice that better fits your needs. Griddles are broad, flat metal cooking surfaces that often come integrated into ranges. Griddle-grilling is common in commercial kitchens, especially in combination with use of a branding plate to give the appearance of traditionally grilled cuisine. Like the use of stovetop grilling pans, griddle use is low investment (as most commercial kitchens have already invested in griddles - they are extremely versatile). Griddles come in various styles, including raised ridge griddles that are popular for those seeking to griddle-grill. See our Commercial Range Guide for more information on griddles. Flattop grills resemble griddles in that they are essentially slab metal cooktops, but they perform differently - while griddle heating elements are straight, the heating element on a flattop grill is circular, which creates a very hot radial heat spread over the flattop surface. Flattop grills are, like griddles, extremely versatile, and can be used not only for grilling, but also for roasting, braising, sautéing, steaming, toasting, stir frying, and more. Further, pots and pans can be placed directly onto the flattop surface. As such, many smaller kitchens have taken to flattop grills for their space-saving versatility. They are, however, somewhat more expensive than griddle tops.